Will Backing Up My Computer Back Up My Email? - Ask Leo! Will Backing Up My Computer Back Up My Email? In order to figure out how to back up your email you first have to figure out where it lives. It might be on your computer; it might be out on the internet. I’m currently preparing to back up my computer for the first time and I’m unsure of the answer to the following question. If I do either a system image or a regular backup of my Windows 7 computer, will my Outlook emails also be included in the backup or do I have to first back up the emails to a PST file; do the backup and then import the emails back if I ever need to restore the system? In checking the Microsoft site and two other searches, the only answers I find are “…..will backup all files, programs, etc….” and no mention about emails. I hate to assume that the emails will be backed up only to find that they aren’t after spending the time to do it. This is an awesome question and the answer’s actually somewhat frustrating. Your email may or may not be backed up! It really depends on exactly where your email lives. Once we know that, then we can make some more helpful statements. An image backup backs up everything that is stored on your computer – everything. So for example, if you use an email program like Outlook (not Outlook.com – that’s a website) Thunderbird, or Windows Live Mail, or many others, then the email that has been stored by those programs absolutely will be backed up. You asked if your email will be backed up “if I do either a system image or a regular backup…”. I don’t know what you mean by a regular backup; there’s really no such thing. Are you thinking of a “regular backup” as an operation that backs up just your data? Well, if you’re using an email program, as I’ve just described, and if your email program is storing that email on your computer in a place that the backup program considers a place for data files, then yes, the email is probably getting backed up. But it might not be if the backup isn’t configured to back up the folders on your machine where your email happens to be stored. Now, if you access your email via a web browser like Internet Explorer, Firefox or Chrome (common when you’re using an email service like Hotmail, Gmail, or Outlook.com); or if you use a website provided by your ISP or some other online email provider; then your email is not stored on your computer. In that case, backing up your computer, no matter how you do it, does not back up your email … because your email isn’t there. The key to backing up web based email – at least the most common and what I think is the easiest way — is to get it on your computer. You do that by installing a mail program and configuring that mail program to connect to your email service. 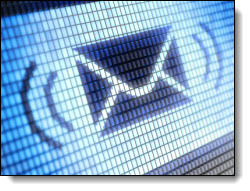 Chose IMAP as the access method when you set up the email account in the email program. IMAP is often the default. That means that email will be copied from the email server to your PC. Suddenly, you have two copies: a bare-bones backup right there. One copy remains on the server on the email service, and the other is in your PC. When you then back up your computer, your email will be backed up as long as you either perform an image backup (again, backing up everything); or your backup is configured to include the folders where your email program stores your mail. So, yes, it’s very important to know exactly how your email is handled and where it lives – so that you can know that it’s getting backed up. You don’t want to just assume one way or the other. What Does It Mean When My Email Program Asks If It Should Compact My Email? - Compacting should be completely transparent. It makes files smaller and potentially makes access of email a little faster. There is one dramatic exception. How Do I Get My New Email to Be the Default Email in Windows? - Figuring out what is what with emails and email accounts can be quite confusing. But when all is said and done, you only need to change a simple configuration. What Email Program Should I Use After Outlook 2003? - There is an easy solution, and a not-so-easy solution. It's going to depend on how much money you want to spend. « Previous post: How do I protect the files on a portable hard drive? Well… this sort of leaves me wanting more. If I have Outlook, which I do, how do I back it up with my other data? Yes, I could back up the whole disk – imagewise – but with an almost-full 1 TB disk I’d need a 1 TB disk to take the backup image; then I’d need more space to take subsequent backup updates. With my .pst files (plural) being multi-gigabytes in size, a single small change in any of them would require multi-gigabyte updates, every time. My terabyte backup disk would be overflowing in a very short time, it seems to me. Even if I did locate my .pst’s and I backed them up, would the same tiny touch on them require total-file backups; I think it would. And – how much of the AppData ..Outlook folder should I back up? Can I do it while Outlook is running? Should I back up my entire profile folder branch ..including my movie editing w-i-p project files, …and the hundreds of megabytes of temporary browsing files? If my docs, music, video, download, picture, etc files are on a separate disk, will a data + profile-from-the-system-disk backup marry up nicely upon restore? Have you ever done it? Anyone? It’s a mystery wrapped in a riddle. Want to take this further, Leo? One feature that Outlook has which might help in the Outlook backup is to archive your older message. This way you can have your older emails in a .pst file which is not changed each time an email comes in. If you open the “Files” tab (Outlook 2010, I believe the Windows Orb will get you there in 2007) Then click the “Mailbox Cleanup Tools” button and select “Archive”. From there, you can choose which folders you want to archive, the name of the .pst file you want to archive them to and the the older than date of the messages you want to archive. As for your movie editing WIP files, if you are still working on them, you can decide which backups you don’t need anymore and possibly keep the latest two backups or something like that. If you’re backing up data files, you won’t need any backups of Temporary Browser Files. One problem with backing up files in the AppData folders is that many of these are dynamic files which constantly being updated by their corresponding programs. Restoring these will likely restore them to a state which would not be useful. My suggestion: get a larger external drive for your backups and use Macrium Reflect paid version and do daily incremental backups. I use a 3TB drive. I’d recommend a minimum of 3 or 4TB in your case. You can use the 1TB drive to back up your original backup before incrementals. You could move that to a location away from your computer for extra protection. That’s how I do it. I don’t believe you can do it while Outlook is running. How much? I can’t really say. How much risk are you willing to take on? Backing up only, but all, the .PST and .OST files should, in theory, backup all your mail, calendar, notes and whatever else is in Outlook. Except, maybe settings. Some of those are in the registry, some of those are in files that accompany it in the AppData folder (and no, I know of no canonical list of what goes where). This is why I *love* image backups – there’s no question that you’re backing up everything you might possibly need. An image backup will be smaller than the original because most backup programs use the original. My rule of thumb, though, is to have a backup drive that is 2x the size of the drive you’re backing up. Between compression and incremental backups that’s typically enough to keep two full backups taken monthly and a month (at least) of incrementals. If you have nearly a terabyte of data – is it backed up AT ALL? If it’s just on that one disk you’re at risk of losing it … all … without warning. I have almost 2 gigs of e-mail in my online Go-Daddy account that I need to remove and archive. I tried downloading it using Thunderbird but was not able to download the e-mail in my SENT and other folders. I could transfer SENT mail to my INBOX and I believe that would give me the archive I need. Is there a better way to do this with Thunderbird? Are there other quality programs out there that are open platform? I am assuming I would always be able to read old archived e-mail without connecting to the Internet. After searching through your website, I was reminded of the 2GB file size limit in FAT32 external hard drives to keep in mind for large archive files. A slightly unrelated question: Is there a way to send and receive e-mail without having to have another party handle and control it for me? I forgot to mention that in attempting to archive my 2 GB of e-mail while using Thunderbird, that I was only able to create a moveable and usable archive buy using the portable version. I found that by using the full installed version, I was either not able to find the archive file or that I was not able to open the archive file after moving it to another computer. Installing the portable version in a folder on my desktop allowed me to move that folder which contained the archived e-mail and program to another computer and easily access my old email. I used portable Thunderbird from portableapps dot org. As important as e-mail is, I am surprised that there are no solutions that allow us to have full ownership and simple control of our data. It seems like we are only ever co-owners of our e-mail. @JohnH: A couple of things. First, FAT32’s is 4GB, not 2GB. Regarding Thunderbird, check out this article: http://www.howtogeek.com/howto/44791/how-to-backup-your-web-based-email-account-using-thunderbird/ Note it’s use of POP for backup purposes versus IMAP — that’s important. Also, Firefox has an add-in called “Copy Folders” that is specifically designed to do what you want: https://addons.mozilla.org/en-us/thunderbird/addon/copy-folder/ Hope this helps. I can’t find My I’d in hotmail. I have windows mail and I back up. Somehow my email folders disappeared along with ALL my e-mails. I do back up everything; but, am unsure if emails go into that back up. How do I figure that out and try to recover my e-mails? I’ve been backing up my C: drive. I had to get a new computer and the tech transferred “everything” from my old Windows 7 computer’s hard drive to my new Windows 10 computer. My mail program that I used for storing my most important email (things I did not want kept on the internet — medical info, financial info, etc.) is nowhere to be found on my new computer. BUT I’m not sure what I should do with my backup at this point. Just plug it in? Then what? I certainly don’t think I should put everthing on it onto my new computer since most everything is already there. I’m so beffudled. What you do next REALLY depend son exactly what email program you were using, and what email program you’re using now. I strongly recommend getting someone hands-on to help you through this process.